I’m a bit envious of Josh Alan Friedman for several reasons. 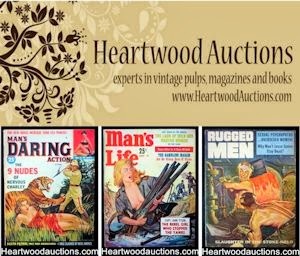 His father was Bruce Jay Friedman, who – prior to becoming a world famous novelist, screenwriter and playwright – was the editor of some of my favorite vintage men’s adventure magazines for Martin Goodman’s Magazine Management company. 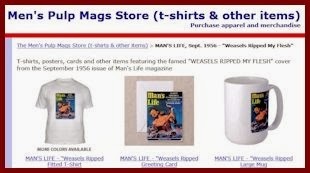 As a result, Josh got a unique inside look at the realm of men’s adventure magazines as he was growing up in New York City in the 1950s and 1960s. Josh is also an excellent writer. 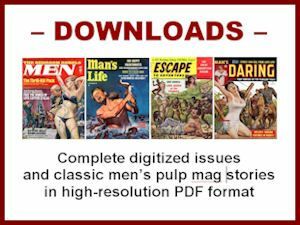 He contributed chapters to two of my favorite books about vintage men’s magazines – It's a Man's World and Volume 3 of Dian Hanson’s History of Men’s Magazines. In both, he relates some of the insights he gained by being able to hang out at the Magazine Management offices. Recently, Josh published the original version of his chapter from Hanson’s book on his Black Cracker Online blog. So, on his blog, Josh lets us read his original piece, with cover art he picked himself. 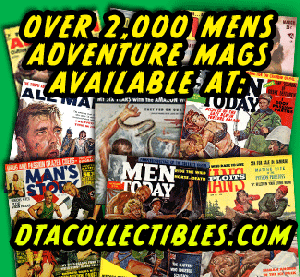 He says it is the first of several posts he’ll be doing on the subject of men’s adventure magazines. I look forward to reading more. As I explored his blog, I also discovered that Josh has a new book — Black Cracker — published by Wyatt Doyle Books. It’s about Josh’s childhood as the only white boy to attend New York’s last segregated school. And, that’s just one of a long list of interesting books Josh has written or contributed to. I also discovered that Josh may have picked up some musical pointers from African American friends he made in school. Because he is a damn good blues guitarist and singer, with several albums to his credit. Since I also play guitar and sing a bit, that gives me another reason to envy Josh. 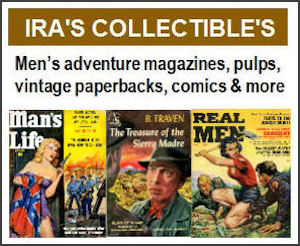 And, another reason to hope I’ll be able to meet him someday, so we can talk about about men’s adventure magazines and jam a little.